There is something in the sound of the bagpipes that evokes our deepest emotions when we hear it. The same sound can be either exhilarating or deeply moving depending upon what tune or tunes are being played. Over the years, I have had countless people tell me that they want the bagpipes played at their funeral. Often Amazing Grace is requested but I have also been asked to play other tunes with special meaning. It is gratifying to me when I am able to honour their last request by providing this service. The bagpiper may play outside the church to call mourners together for the service. 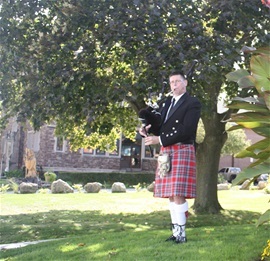 The bagpiper can play a special piece during the service.The bagpiper may play outside the church as mourners are leaving the service. When playing graveside, the bagpiper can play as the mourners arrive and until the deceased is carried to their final resting place. The family often requests a special tune, usually Amazing Grace, at some point during the graveside service. After the service as the mourners are leaving the graveside, the bagpiper can play Going Home and other soulful melodies.